Most of the times you would want to customize the EC2 image that you want to run. It would help you quickly spin up a new instance or put it behind an auto scaling group. To do this you can create an image out of your current running EC2 instance. But this is an incremental process. So you may want to create a new image after making some changes to EC2 instance spun up from the current image. Once the new image is created you can delete the previous AMI/image. In this post, I will tell you what are the steps to do so. Select the region from the drop-down at the top based on which region your Alocatedocaled. In the navigation pane, click AMIs. Select the AMI, click Actions, and then click Deregister. When prompted for confirmation, click Continue. NOTE: It may take a few minutes before the console removes the AMI from the list. Choose Refresh to refresh the status. In the navigation pane, click Snapshots. Select the snapshot, click Actions, and then click Delete. When prompted for confirmation, click Yes, Delete. Terminate any EC2 instances that might be running with old AMI. Delete any EBS volumes for those EC2 instances if "delete on termination" is not set. When you create an AMI it creates a snapshot for each volume associated with that image. So let's say your EC2 instance has 2 EBS volumes C drive and D drive of 30 GB and 50GB respectively in size then you would see 2 snapshots for them under snapshots section. Your AMI size will be the sum of individual snapshot size (i.e 30GB + 50GB = 80GB). To successfully delete the AMI you need to deregister the AMI and then delete the snapshots manually. And finally, when both are done terminate the EC2 instances that you might have running with old AMI. 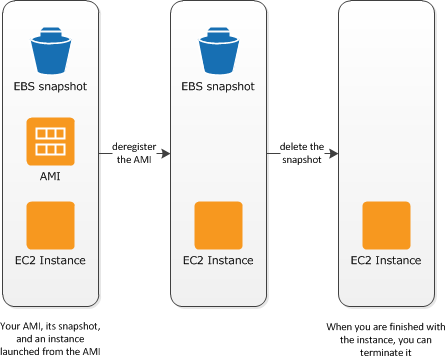 When you deregister an Amazon EBS-backed AMI, it doesn't affect the snapshot that was created for the root volume of the instance during the AMI creation process. You'll continue to incur storage costs for this snapshot. Therefore, if you are finished with the snapshot, you should delete it. You can deregister an AMI when you have finished using it. After you deregister an AMI, you can't use it to launch new instances. When you deregister an AMI, it doesn't affect any instances that you've already launched from the AMI. You'll continue to incur usage costs for these instances. Therefore, if you are finished with these instances, you should terminate them. AWS will not let you delete a snapshot associated with an AMI before you deregister the AMI.